Recently we have started a second intake into our System Development Workshop and in this brief article I’d like to discuss one of the common issues that are emerging from both traders that have 12-18 months worth of experience, and from traders that are just starting to climb the learning curve. So today let’s discover the correct way to use any technical indicator. This is a screenshot of how my very own charts used to look many years ago. Can you even see the market through all the indicators? Technical Indicators are tools. But without a good understanding of what exactly your “tool” does, you won’t know when or how to use it. You might abuse of it, just like the Law of the Instrument teaches us. Instead, a savy trader knows exactly when and how to use his tools, and when to avoid them completely. As the chart above illustrates, I too fell into the “indicator excess” trap. And my equity curve suffered as a result. Learn from me: do not blindly follow indicators. Learn what they are and what they are telling you. So let’s utilize an example. We will use the Relative Strength Index, a common technical indicator, to illustrate the proper way to use indicators. a) How is the RSI built? 4. 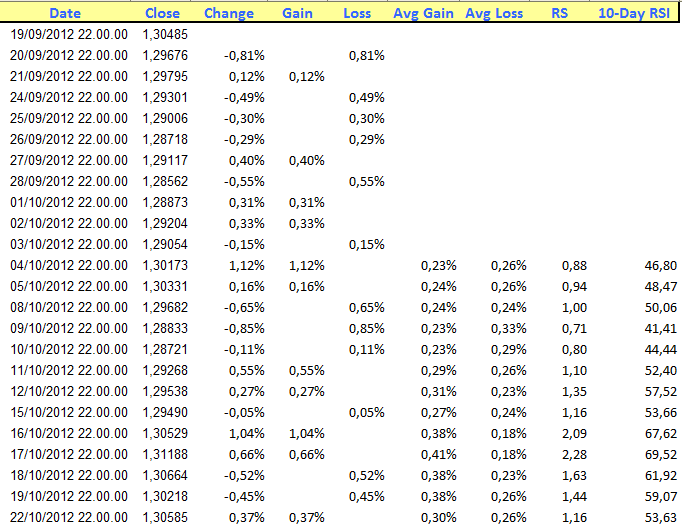 Track the 10 Day average UP % and the 10 Day average DOWN %. By doing this exercise, you can understand that the RSI is nothing more than a measure of the average movement UP or DOWN over the lookback period (10 days in our example). It’s a measure of Momentum, in other words. b) What does the RSI actually indicate, in plain English? The RSI compares recent upwards movements to recent downwards movements in the closing price of an asset. 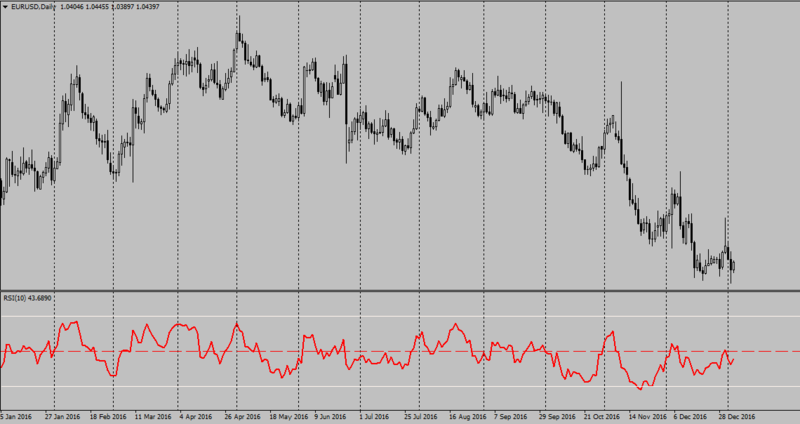 This means that if the asset is, on average during the lookback period, moving up then the RSI will be above 50. If it’s moving down, it will be below 50. We now understand that the 50-line is the “bullish/bearish” line. 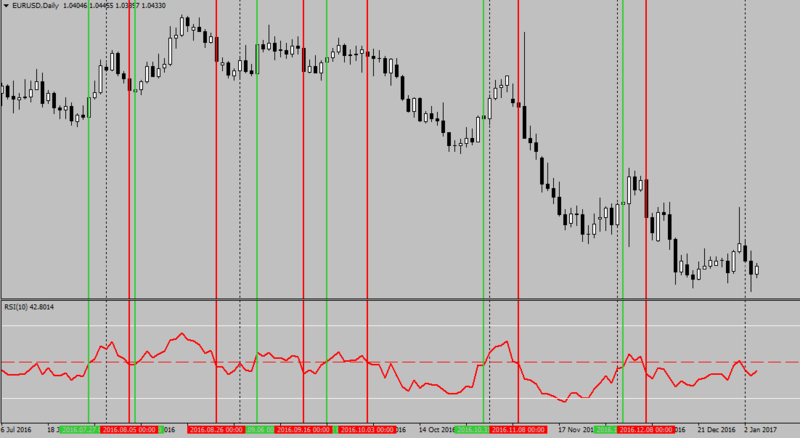 10 Day RSI applied to the EURUSD Chart. Green vertical line is where RSI > 50; Red vertical line is where RSI < 50.
c) What market dynamics (if any) are captured by the indicator? The RSI captures the “size” of the candles, hence measuring the average positive or negative movement over the lookback period. In a strong downwards trend, the RSI should remain below 50 even on pullbacks. If the RSI starts shifting, then it’s telling you that the “retracement candles” have more strength then the trending candles, and that is potentially indicating a change of trend. If you choose to use indicators, make sure you know them inside out. What are they helping you “see”? What is their strength, and what is their weakness? By learning your indicators inside out, you’ll be gaining much more insight than by simply overlaying them on the chart and “trusting them blindly”. Justin Paolini is a Forex trader and member of the team at www.fxrenew.com, a provider of Forex signals from ex-bank and hedge fund traders (get a free trial), or get FREE access to the Advanced Forex Course for Smart Traders. If you like his writing you can subscribe to the newsletter for free. The post The Correct Way to Use Any Technical Indicator appeared first on www.forextell.com.